Thanks to Dr. Feriyl Bhaijee, University of Mississippi Medical Center (USA), for contributing this case. To contribute a Case of the Week, follow the guidelines on our Case of the Week page. (1) Our Feature page for April is Laboratory Accreditation / Education / CME, and highlights our advertisers ARUP Laboratories, The American Society for Clinical Pathology (ASCP), Board Vitals, College of American Pathologists (CAP) and Educational Symposia. It also contains an original short article, "Laboratory Accreditation: The Business of Blood Banking", by Jaleh Mansouri, M.D. (2) Thanks to your support, March 2015 had record traffic of 679,473 visits (average of 21,918 visits per day), and a record 2.62 million page views. Phase 2 of our Website upgrade will probably not start until mid May 2015. Read more. (3) Thanks to all who stopped by our booth at USCAP. We posted many photos on our FaceBook page. We also signed up many new authors, and likely members of our Editorial Board. (4) Our website continues to be a free, no registration website focused on the needs of the pathology community. But we have started an optional Membership feature to support the expensive changes we are undertaking, including expanded IT capabilities (new Home Page, new Chapter and topic templates, better Search, improved Mobile use), expanded Editorial Board and more frequent topic updates. Resident / Fellow level: Abul Ala Syed Rifat Mannan M.D., Mount Sinai - St. Luke's Roosevelt Hospital Center, New York. 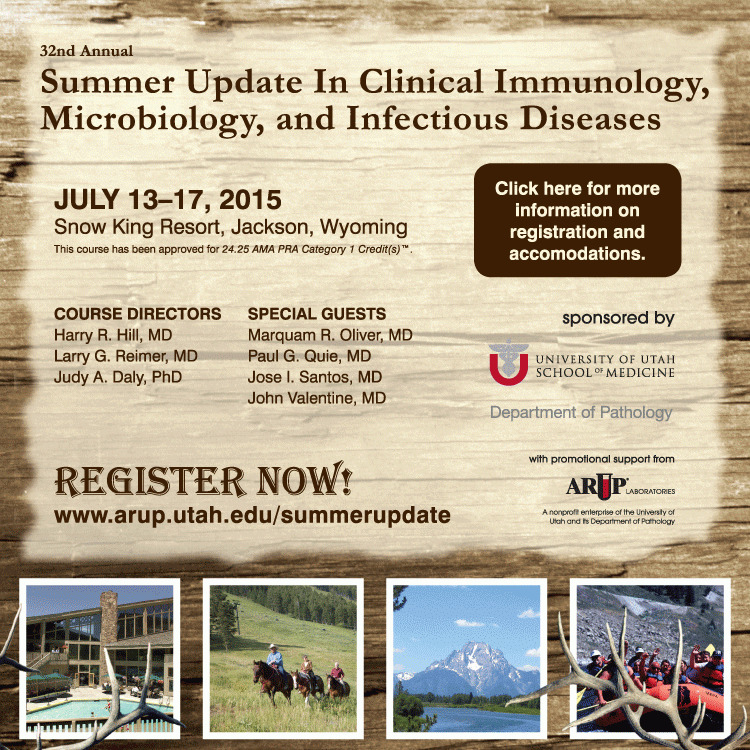 If our website is helpful to you, please consider an Individual membership by clicking here. 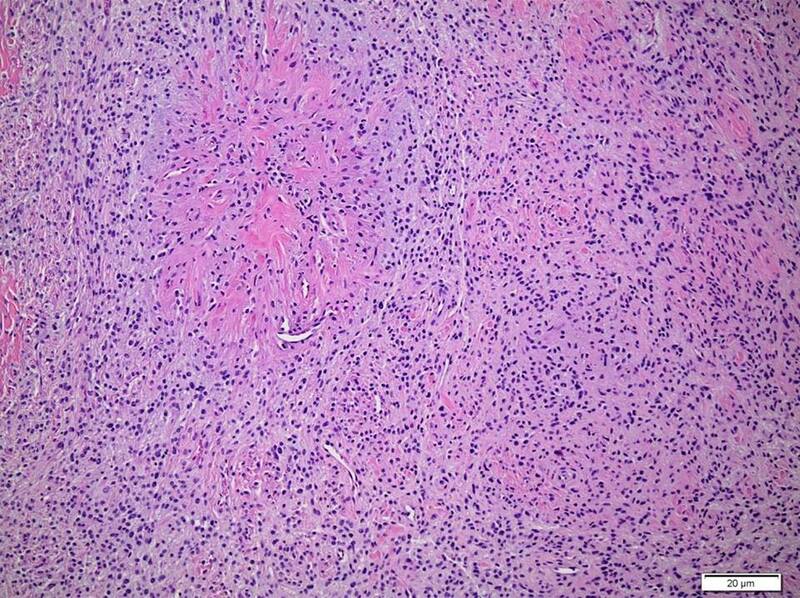 A 56 year old man presented with a 5 cm painless mass in his thigh, which was surgically excised. Grossly, the mass was well-circumscribed with an osseous rim. Immunohistochemistry on the lesional cells showed focal S100, neurofilament and desmin positivity. IHC and molecular studies for INI1 were not performed (unfortunately). 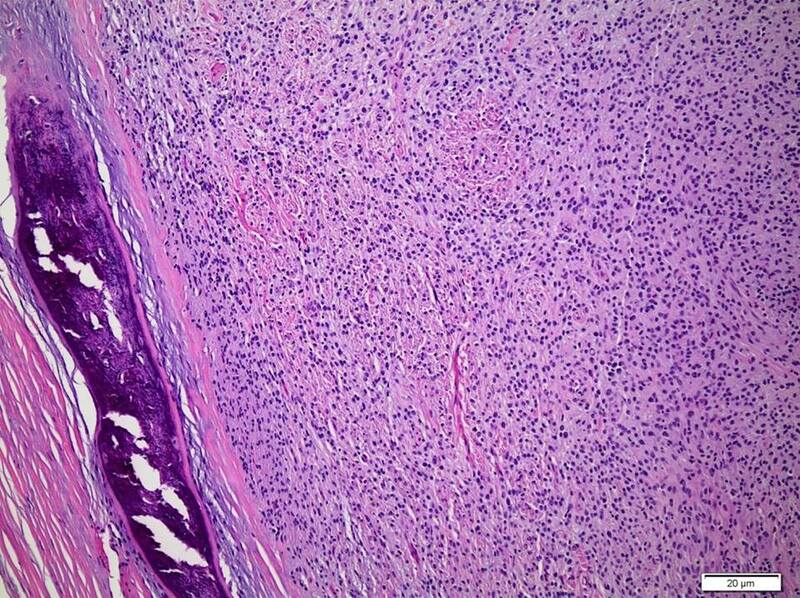 Ossifying fibromyxoid tumor of soft tissue is a rare mesenchymal tumor of intermediate malignancy characterized by peripheral metaplastic bone and cords of bland, round cells in a fibromyxoid matrix. It was first described in 1989 by Enzinger, Weiss and Liang as a tumor of primarily adults with a male predominance, presenting as a small, painless, well circumscribed mass in subcutis or muscle, typically in the extremities, trunk or head and neck region (Am J Surg Pathol 1989;13:817). 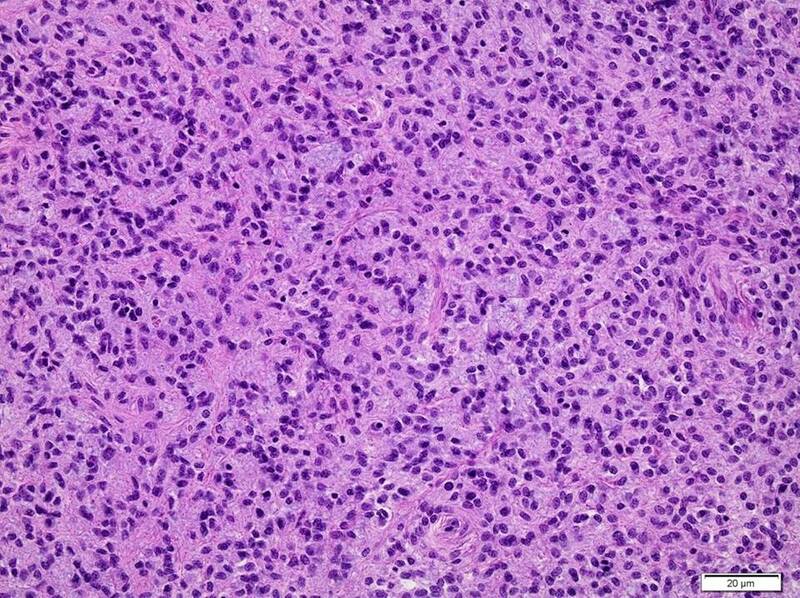 Grossly, the tumors have a median size of 3-5 cm (range 1 to 21 cm). They classically have lobular architecture, corded and trabecular growth patterns, moderate amounts of myxocollagenous matrix, and often focal peripheral metaplastic bone formation (Am J Surg Pathol 2008;32:996). 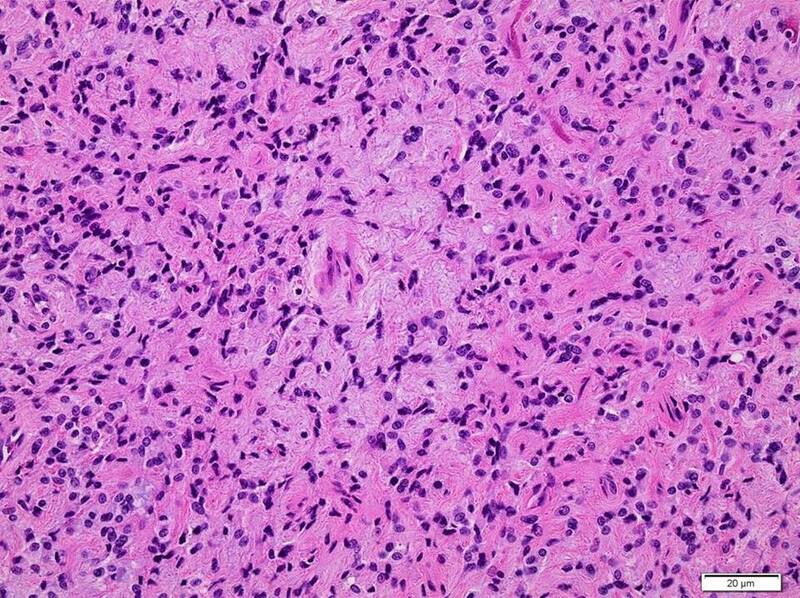 The tumor cells usually have indistinct cytoplasm, vesicular nuclei, no / mild atypia, and no / minimal mitotic activity. Tumors are typically S100+, with occasional focal positivity for desmin, GFAP, and AE1/AE3. INI1 is lost in a "mosaic pattern" in 74%, and FISH shows INI1 deletion in 71% (Am J Surg Pathol 2011;35:1615). Up to 85% demonstrate recurrent gene rearrangements, typically PHF1 (49-80%, Am J Surg Pathol 2013;37:1751, Genes Chromosomes Cancer 2014;53:183). 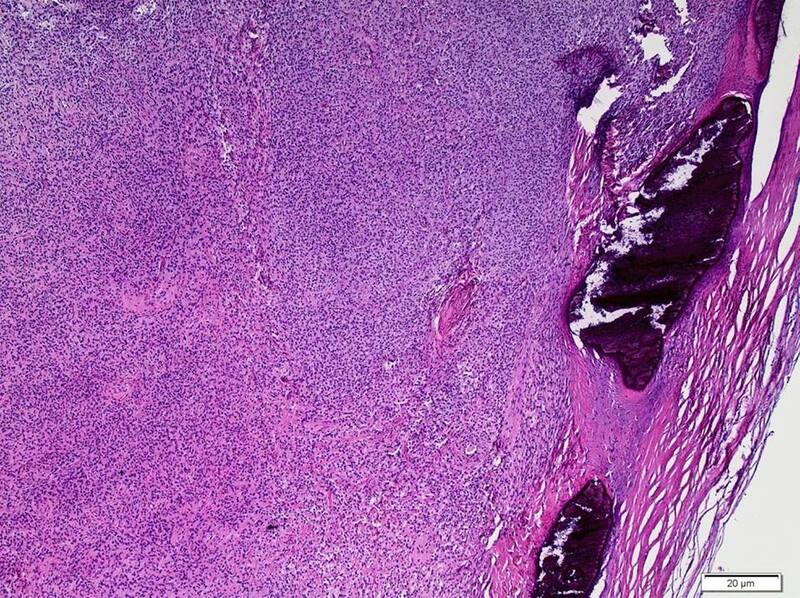 Similar gene fusions have been found in endometrial stromal sarcoma. Cases have been divided into typical, atypical and malignant, using the Folpe and Weiss system, based on high cellularity, high nuclear grade or >2 MF/50 HPF (Am J Surg Pathol 2003;27:421). Excision of typical and atypical cases is usually curative. 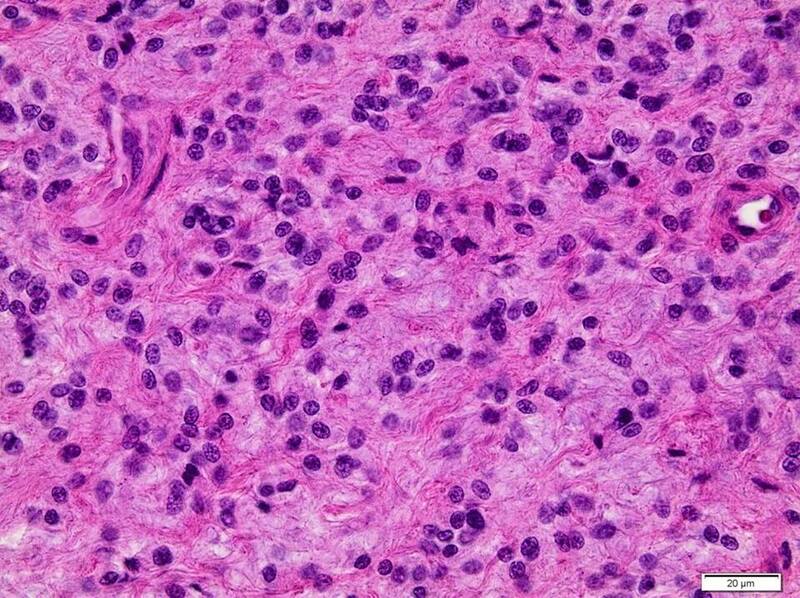 Malignant cases are associated with local recurrence, metastases or death (Am J Surg Pathol 2011;35:1615).